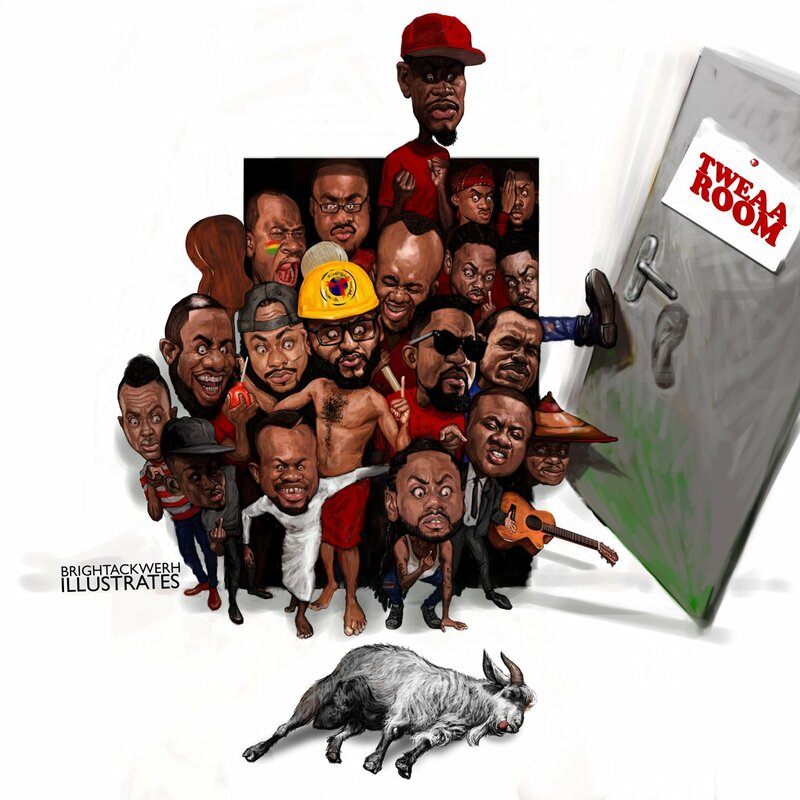 the first time bright tetteh ackwerh’s work gripped my attention was about 3 years ago when he posted an illustration of sarkodie; a well known ghanaian musician looking dapper behind dark shades and clutching a bottle of baileys irish cream in his left hand; the funny twist. it went viral pronto because of the tongue-in-the-cheek wisecrack, as the musician, featured in a bet cypher, had spat in his raps, “i’m the missing ingredient in a perfect meal, call me the irish cream‘. the line pretty much didn’t sit well with ghanaian fans all over the world, but bright ackwerh’s work; an unassuming and clean-cut masterpiece, did poetic justice to the situation. fast forward 2016, we celebrate the artist coming tops in the kuenyehia art prize competition leaving us to digest his works “bearing visual weight-” same words popularly used to describe russian painter and sculptor kazimir malevich‘s work. aside the layering, some of bright’s works bear humour that stalks to tickle for days. from his million man riot graffiti piece at last year’s chale wote festival to his international affairs illustration work about the government’s decision to accommodate two guantanamo bay ex-detainees in ghana, we find the prolific artist always coming up with fresh perspectives to the turf. although we all know that combining genres including illustration, painting, graffiti and more is like weaving through human traffic at makola on a peak market day. like a few other artists in the sub-region, ackwerh is a powerhouse on his own; dropping witty quips when he posts his art, responding to critics in a professional way at the same time manning everything else which comes with the craft. usually, he releases teasers or trailers to get people drooling even before the kaleidoscopic revolutionary bombs. he commented visually on trump, black lives matter, yasin bey in sa, nana aba’s non-present selfie, etc. how he weaves work which critiques local as well as the international scene speaks volumes and volts. It might surprise you that aside being a social commentator and dabbling in the thick of affairs in the political realm, he affords flak for sectors like sports, music, the celebrity world and even religion. bright’s newest work stands out from the lots. his tweaa room piece which won the kuenyehia prize went viral. his first #veryverygraphic piece which features obama and gaddafi was epic but this new one; ‘nonagenarian tins’ might crack the internet! 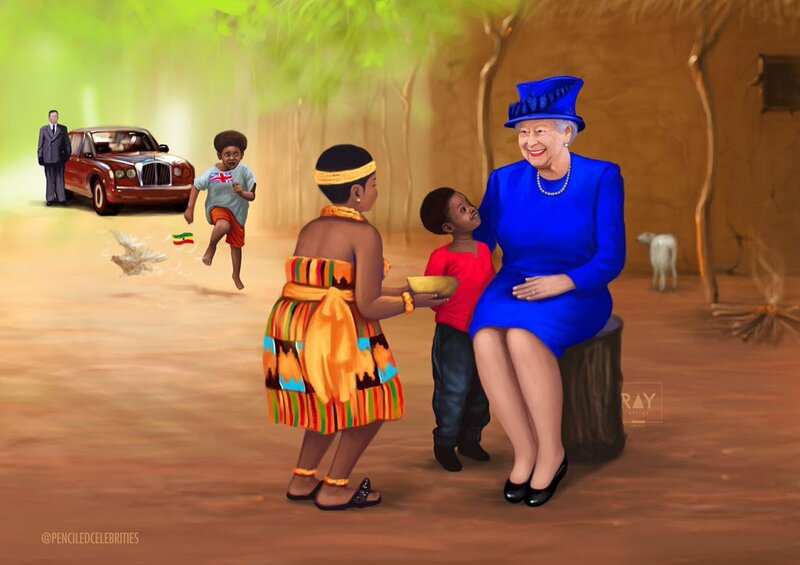 from 1957 to 1960, the head of state under the ghana independence act 1957 was the queen elizabeth ii. she was still the monarch of the united kingdom and the other commonwealth realms . meaning, during those 3 years plus 117 days, ghanaians were still under her crown span even as she was based in the house of windsor. when she handed over power, she visited ghana in 1961 and again with prince philip in 1999, this time around together with a 45-member royal delegation. in 1999, the warm ghanaian air welcomed her as she descended from her chartered plane, to meet traditional dancers and drummers in full regalia singing ga praises to her. a gaggle of some 5,000 or more cheered and waved, led by the then president jerry john rawlings; who was in his 17th year in power after 2 successive coups and being voted into power in 1996.
the queen inspected the military line-up and was given a 21-gun salute. the undermining results of coups with regards to the common people was very afflictive and the years of military rule had taken a heavy toll on the country. also, proceeds from gold had experienced a crucial dip and had forced the government to seek foreign ‘help’ to salvage its economy. yet we marched; thousands of people forming a sizable part of the labour force of the country, to the streets to cheer because the queen was in town. we forget easily that we had to fight a series of colonial wars against the british only to gain independence, were looted extensively, they build their economy off our backs, our civilization and education crumbles due to their structures we adopted, and we even forget nkrumah who was installed as first president was dropped like a dry leaf. but yet, it’s left for us to discuss; how do we feel about lizzy having an annual birthday party on the grounds of ghana every year? does it happen in every other commonwealth country or just here? is it significant of her monarchy? how does it go to affect us as a ‘liberated’ people? what are your genuine thoughts about this piece? leave a comment. artist unknown. if you will remember, in 1999, the accra metropolitan assembly stripped the streets to be visited by the british royals of hawkers, news-vendors and porters, and roaming lunatics were chained. how does that sound in our own ears? all this ‘show’ might have been because the government was and is still dependent on ‘aid’ from the abrofo, also their biggest trading partner with substantial mining and other interests (but what percentage of that trickles down?). sincerely, if we do not discuss these things, will the repetitive mental slavery route ever be cut off? wont we be left to dig our own graves stuck in a capitalist neo-colonialist treadmill continuously fueling the western political economy and so on? the culminating moral is that images, films, stories, edifices, events are more powerful than we sometimes think. as much as we only see the dilapidated, dependent and violent part of the continent on television and other electronic and printed media, we grow to be psychologically affected losing esteem and stories like that of yaa asatewaa of the ashanti or queen idia of benin and traumatically become beasts of no nation. the vividly apparent, and emotionally powerful nature of imagery is why white jesus and santa claus exist. it is of no doubt a healthy community attitude based on socio-political consciousness that students made an attempt to decolonize education across south africa on 9th april 2015, following a university of cape town council vote, when the statue of the imperialist cecil rhodes was removed. yet we still find a rhodes’ statue at oxford’s oriel college where he schooled in the 1870s before returning to south africa to found the de beers diamond empire which made him one of the world’s wealthiest men off the blood and sweat of the local people he oppressed. “they only want him[mugabe] out because he always speaks his mind true..ok…so mugabe cuts the cake icing soldier’s head off and lizzy, practically, is chopping africa up. this is to say; “what is really going on”?…the power images have and how they go on to inspire real life happenings and thought patterns- white jesus’ imagery was largely unchallenged at its creation and became an accepted ‘fact’. ben okri speaks a lot about this in his diagnosis of the power of stories;” bright ackwerh explains. mugabe having a truncated buckingham guard on his plate as lizzy is happily ‘unlooking’ while making a deep slice into africa; a turf which is rich in all the gems you could think of, a people who invented mathematics, chess, alphabets, adinkra, kente, pyramids, african electronics, you name it. KUENYEHIA PRIZE 2016 ANNOUNCES FINALISTS: LIST MIGHT SURPRISE YOU! The Kuenyehia Prize was established by Elikem Nutifafa Kuenyehia in 2014 with the main objective of identifying, rewarding and promoting Ghana’s most outstanding artists between the ages of 25 and 40. In addition to prize money and materials totaling up to twenty five thousand Ghana Cedis (GHS 25,000), one winner and two runners-up get to benefit from business training and coaching. This year’s jury panel was chaired by Prof. El Anatsui. One ultimate winner and two runners-up will be selected to share the GHS 25,000 prize money tonight! F53/7, Emmause Lane, Off 2nd Labone Street, Opposite Law Institute (End of Celsbridge Rd), Labone Accra. Tonight, make a date with the distinguished Golden lion award winning artist- Professor Emeritus El Anatsui. The shortlisted artists of last year’s edition were Isaac Addico, Negyem Adono, Charles Agbetsoamedo, Kwame Akoto-Bamfo, Gideon Appah, Kwadwo Boateng Asare, Kelvin Haizel, Isshaq Ismail, Ian Kwakye and Michael Lokko. The works of the shortlisted artists were exhibited at Nubuke Foundation, Accra from March 1 to March 31, 2015 and the winner; Kwame Akoto-Bamfo was announced at a grand event on April 2, 2015. The panel of judges for 2015 comprised of Florence Benson; a leading promoter and collector of West African Art, Godfried Donkor; a London-based artist who represented Ghana at the prestigious Venice Biennale, Rikki Womegah Kwahu; artist and lecturer at Takoradi Polytechnic, Charlotte Langhost; art historian and curator as well as Constance Swaniker; sculptor and Managing Director of Accents & Arts. Author Kwame 'Write' AidooPosted on April 14, 2016 Leave a comment on KUENYEHIA PRIZE 2016 ANNOUNCES FINALISTS: LIST MIGHT SURPRISE YOU! The board of Osagyefo Kwame Nkrumah African Genius Awards honoured 17 Ghanaian geniuses whose works in arts, science, technology and innovation had become pillars of reference nationally on the 12th of December, 2014. The event took place at the National Theatre. Among those honoured were Dr. Ave Kludze; first African to command a spaceship in orbit, Professor Kwabena Frimpong Boateng; first African to perform open heart surgery, Alhaji Ibrahim; a renowned smock weaver from Tamale, Professor Martin Owusu; actor, playwright and theatre scholar, and Professor Ama Ata Aidoo; celebrated African dramatist. The awards ceremony is a biennial event. In between the award years, the Board has instituted a quarterly lecture series to enable our honorees to share their thoughts with the rest of the world. The first of these lectures took place at the British Council in November of 2015, featuring Mrs Kate Quartey Papafio, CEO of Reroy Group whose company has evolved from being an importer of electrical cables and conductors to a net exporter of these products. In the light of showing that artists and creatives in Ghana are as important, there’s honour in the fact that the next celebrant is Professor Martin Owusu, who won the African Genius Award for Drama. This second event takes place on Friday 15th april, 2016 at the Methodist University College, Dansoman, where the professor currently lectures, after retiring from the University of Ghana where he was once lecturer and director of the School of Performing Arts. The event is scheduled for 4pm through 6pm. Among the highlights will be excerpts of two of his most celebrated plays. He will then make himself available for a conversation session with the audience. The entire membership of the Ghana Culture Forum will be present to demonstrate solidarity, and also to take part in a Q&A session during which the celebrant will engage in a conversation with the audience on the state of the Arts, in general and drama, in particular. If you’ve not heard about blaxTARLINES KUMASI yet, you should update your art loving senses because this collective looks to take the world by fire rainbows. blaxTARLINES KUMASI happens to be a project space for contemporary art founded by the Department of Painting and Sculpture at the Kwame Nkrumah University of Science and Technology (KNUST) and proud producers of “The Gown Must Go To Town” which could easily be ranked as one of the most intriguing exhibitions in the country last year. The term “The Gown Must Go To Town” was borrowed from a line in Kwame Nkrumah‘s 1963 speech ‘The African Genius’. The Gown must go to Town was a grand exhibition displayed at the Museum of Science and Technology in Accra, and it went to honour two of Ghana’s representatives at the 56th Venice Biennale; highlighting the works of 28 year old Ibrahim Mahama’s participation as the youngest artist of the All the World’s Futures exhibition as well as Ghanaian sculptor El Anatsui for receiving the Golden Lion for Lifetime Achievement. There was this other exhibition called ‘Silence between the Lines’ at a repurposed car showroom in Kumasi. This time around, blaxTARLINES KUMASI brings you a more organic and site-specific exhibition called “if you love me…” between the 15th of april and 5th may 2016 at the Loco Shed of the Kumasi Railway, opening: 15 april, 3 pm // open daily 9am – 5 pm. “if you love me…” is a collaborative effort of railway workers, occupants, engineers, artists, and students of KNUST. The idea is to take on the space of the Kumasi Loco Shed as a living organism, a structure with a vital life of its own. The independently staged exhibition presents work born out of freedom of thought and practice, steered by attitudes of subtle resistance, activated by suggestions of renewal. The project aims to penetrate the site like a bacteriophage on a host cell, quietly attaching to the cell’s DNA and reproducing, until the space has been regenerated. With Kumasi as its nucleus, the project flows out to other locations along the tracks, from Takoradi to Accra, mapping a trajectory of the railway system. Presenting work by 30 artists and numerous collaborators, if you love me… meditates not only on human love, but that of plants, winds, germs, machines; not only on romantic love, but also toxic, consuming, possibly fatal passion. The pharmakon, both poison and cure, can be the Agent Smith that replicates itself onto subsumed subjects, or the kenosis that empties out the disease. Dangerous, seductive, formless, it floats in free play, disappears into itself, and ever eludes grasp or possession. if you love me… resonates with strategies of “ironic overidentification” as proposed by KNUST art teacher kąrî’kạchä seid’ou — inserting oneself within the site of critique, in order to transform that subject. In this interdisciplinary and intergenerational project, a host of familiar faces and other new ones join together in a labour of love that transcends institutional, intellectual, and categorical lines, toward a more Consciencious future.